Gupta on Marijuana: Will History hold him in the company of Tobacco Docs? Sanjay Gupta on Marijuana: Will History hold him in the company of the Tobacco Docs? Ads like this regularly appeared in publications like the Journal of the American Medical Association. (Click image to enlarge). Reminiscent of the heyday of Big Tobacco, Gupta’s position on marijuana and image is being co-opted to lend credibility to the marijuana industry. 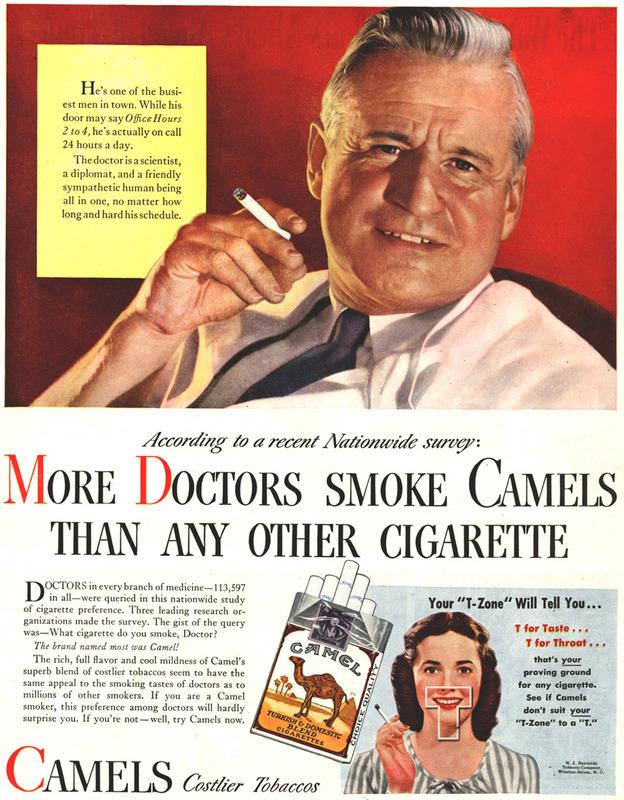 Big Tobacco used doctors for years to convince us that cigarettes were okay. They even had campaigns pitching the health benefits of smoking cigarettes. The same playbook is being used to run the next great public health fraud–the legalization of marijuana. And they’ve got Sanjay Gupta playing the role of the Cigarette “MD”. The University of Stanford hosts a comprehensive archive of the insidious advertising of the tobacco industry. Big Marijuana knows how well it worked and is employing the same tactics adapted to our current digital media age to achieve the same end — an addiction-based mega industry built on lies and manipulation. It starts with decriminalization–appealing (in contradiction to the statistics) for sympathies for the unjustly incarcerated. “One common technique used by the tobacco industry to reassure a worried public was to incorporate images of physicians in their ads. The none-too-subtle message was that if the doctor, with all of his expertise, chose to smoke a particular brand, then it must be safe,” as the Stanford archive describes the technique. And here’s where Sanjay Gupta comes in. Is he being played? Has he been manipulated? Why so well credentialed a man would use so public a platform as CNN to present so irresponsible and un-nuanced a position on the issue of marijuana as medicine is difficult to understand. Among the most enlightened people on the issue of the downstream public health affects of another addiction-based industry that relies on kids to assure their profits, is Dr. Christian Thurstone. In his usual balanced and, “give benefit of the doubt”, measured way, here are excerpts from his thoughts before the airing of Gupta’s “Weed” reports. Perhaps Gupta’s place in history will be at Stanford University’s SRITA archives. Or, perhaps he’ll change his mind again and present a more nuanced stance–we’d welcome that. If, as there appears to be, medical benefits to cannabidiol, then perhaps he’ll support properly supervised studies to prove it, develop dosage, and monitor it. Legalization of smoked weed as medicine is just silly. And for the legalizers, it really never was about medicine. I encourage Dr. Gupta — and anyone else reading this — to learn more about drug scheduling in the United States, which Project SAM does a nice job of explaining here. Rescheduling marijuana is not necessary for more research, and it would do nothing to bring more cannabis-based medications to market. And, naturally, I’m troubled by his assertion that marijuana doesn’t appear to have high abuse potential, when 6 percent of high school seniors in the United States use the drug daily — and when marijuana is the No. 1 reason adolescents in this country are admitted for addiction treatment. Again, I look forward to watching Dr. Gupta’s documentary — I met with field producers and did not meet him — soon. I hope it clearly distinguishes between responsibly developed, cannabis-based medication and smoked marijuana. I hope it thoroughly explains how medical marijuana has affected children and child mental health — and how the harm to them is continuing to mount. I hope it adequately connects the practice of medicine to the legitimate and profound problems for public health and safety that we’re already chronicling. I hope it explains that the medical marijuana movement is largely funded by people positioned to launch the recreational marijuana industry (People who have been hard at work for decades to sow the seeds of confusion that now reigns supreme in our country. See this video from a 1993 conference of recreational drug users.). These problems are the reasons physicians with strong backgrounds in public health policy — such as those at the American Society of Addiction Medicine, the Association for Medical Education and Research and the American Academy of Pediatrics — are now speaking out more boldly against marijuana legalization in its current and proposed forms in the marketplace. It is imperative that someone with Dr. Gupta’s reputation and media platform make all of these distinctions with great care and tremendous clarity.